Q: I know Justice Sotomayor was a bit after your childhood. Who was someone you admired growing up? A: As a child growing up in the 80s, I found Sandra Day O’Connor to be very inspiring. I had always hoped to become an attorney, so it was exciting to hear everyone talk about the first woman appointed to the United States Supreme Court. Q: Wow, so you always knew you wanted to be an attorney? A: Oh yes. When I was nine I drafted an affidavit on behalf of my sister after she was pushed off a bike. We both laugh. She tells me she still has the affidavit framed in her house as a memento. I ask about her family. Her parents were both in the medical field—her father is a retired anesthesiologist, and her mother was a nurse. But it was the stories about her grandfather, a judge of 40 years in the Philippines, that inspired her to follow the legal path. 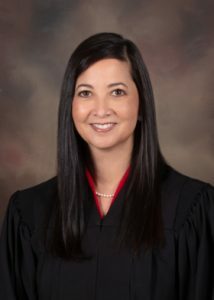 Judge Smith received her bachelor’s degree from the University of Florida and obtained her juris doctor from Stetson University College of Law, where she was active in moot court. She recalled one competition in which she argued both sides of a case at the United States Court of Appeals for the Eleventh Circuit. She said she loved the thrill of it and ended up clerking for a Tampa firm in their appellate department. After she was admitted to the bar, Judge Smith worked as an associate, and later became a shareholder, at Peterson & Myers in Lakeland. Five years ago, Governor Rick Scott appointed Judge Smith to the Tenth Judicial Circuit. While on the Tenth Circuit, she started in the felony division and then worked in the family and civil divisions. She later served as administrative judge over the civil divisions. Chief Judge Jacobsen of the Tenth Judicial Circuit described Judge Smith as an intelligent, articulate judge who writes well. He said he appointed her as the administrative judge over the civil division because she was the go-to person for civil law. He also added the Second District was lucky to have someone who had such extensive trial experience because she understands what happens in the courtroom from moment to moment. Chief Judge Jacobsen also mentioned Judge Smith’s work as chair of the Tenth Circuit’s Fairness and Diversity team. She helped initiate the first annual Tenth Circuit Fairness and Diversity Summit, which has hosted speakers from all over the state, including Justice Alan Lawson of the Florida Supreme Court. Amanda Glass is currently a staff attorney at the Second District Court of Appeal in Tampa. 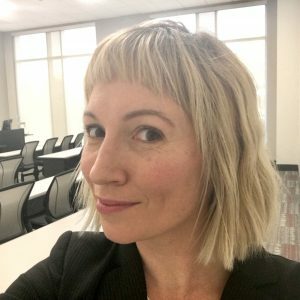 She also teaches legal research and writing courses at the University of Tampa.